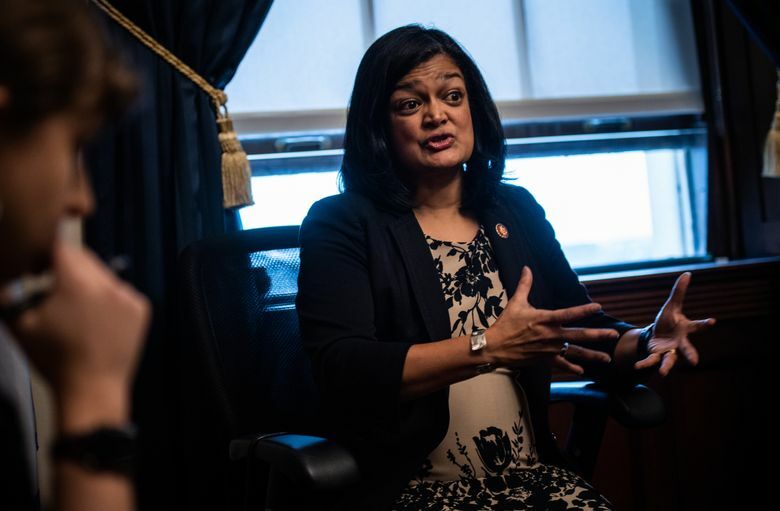 U.S. Rep. Pramila Jayapal is in just her second term but is already a leader of the progressive wing of the Democratic House majority. She co-chairs the Congressional Progressive Caucus and is a leading sponsor of a sweeping Medicare for All bill that seeks to swiftly move the nation to a government-financed, single-payer health-care system. On Episode 104 of The Overcast, Jayapal, D-Seattle, joins political reporters Jim Brunner and Dan Beekman to talk about her ambitious Medicare for All plan — and how it might be funded. She also fields questions on calls to break up Amazon, the 2020 presidential race, and the flap over allegedly anti-Semitic remarks by a House colleague. The interview was recorded in the Seattle studios of public radio 88.5 FM KNKX. On Medicare for All, Jayapal starts with the premise that health care is not like other goods delivered through the private sector. “There are some things you want to have delivered through the market — lifting up my coffee cup here, I don’t want to buy my coffee from the government. I am not looking to buy my computer from the government. However, things that are essential goods that cannot be based on a for-profit marketplace need to be provided by the government. Things like health-care insurance,” Jayapal says. Her legislation does not include a specific funding proposal. A similar proposal by Sen. Bernie Sanders of Vermont has been estimated to cost $32 trillion over 10 years, while reducing overall health-care spending by virtually eliminating individuals’ costs. Jayapal says full funding proposals will come later, and she argues that obsessing in advance about the costs ignores the reality that the current U.S. health-care insurance system is fundamentally broken, delivering high costs and poor health outcomes. Why she’s avoiding an endorsement, for now, in the 2020 Democratic presidential primaries, with Gov. Jay Inslee in the race. How tactics of the Congressional Progressive Caucus differ from House conservatives’ Freedom Caucus. Whether she supports Massachusetts Sen. Elizabeth Warren’s call to break up tech giants, including Amazon. The controversy surrounding allegedly anti-Semitic comments by Rep. Ilhan Omar, D-Minn. Her role as a sought-after endorsement in Seattle City Council races, and other local elections.